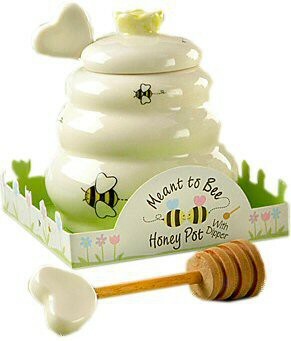 The buzz is that this "Meant to Bee" Ceramic Honey Pot from Kate Aspen is deliciously sweet inside and out! 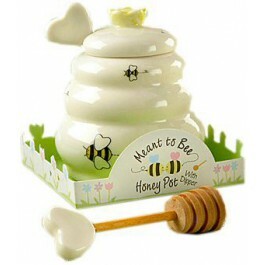 Little yellow-and-black bees zoom around this wedding-white, beehive-shaped honey pot. It’s a favor dripping with charm and practicality and a perfect favor to honor the Bride-to-BEE. There's a notch in the lid where a white, fingertip-size, ceramic heart, attached to a wooden dipper, provides easy access to the honey. Your guests can add their favorite brand and will remember you every time they use it. Box has a glorious garden of pastel purple, pink and blue blooms at the bottom. The bottom of the packaging is highlighted by an enamored bee couple and the words "Meant to Bee" & "Honey Pot with Dipper." A sheer, white organza ribbon and bow, and a flower-shaped "For You" tag makes this favor a sight to "bee-hold!